How does one strike a balance between studies and passion? As Azeezur Rahman says, determination and discipline are key. At the 27th SINDA Excellence Awards, 15-year-old Azeezur was lauded for his achievements in sports. His love for hockey began when he was in primary school. As a Primary 5 student, he made his school’s hockey team and began participating actively in games and trainings. However, Azeezur’s grades began to suffer as he was spending most of his time on hockey. His parents were unhappy that he was neglecting his studies in favour of sports. 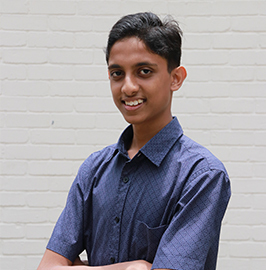 After realising that he had to improve his grades, he enrolled in SINDA’s STEP programme. By consistently revising and clarifying his doubts with his tutors on a 1-on-1 basis, Azeezur’s grades had significantly improved at the end of the year. In Secondary 2, Azeezur received the opportunity to represent Singapore at a hockey tournament in Kuala Lumpur, Malaysia. Pleased with Azeezur’s progress and diligence, his parents became more supportive of his sports endeavours, discussing the games with his coach and providing refreshments for the team.